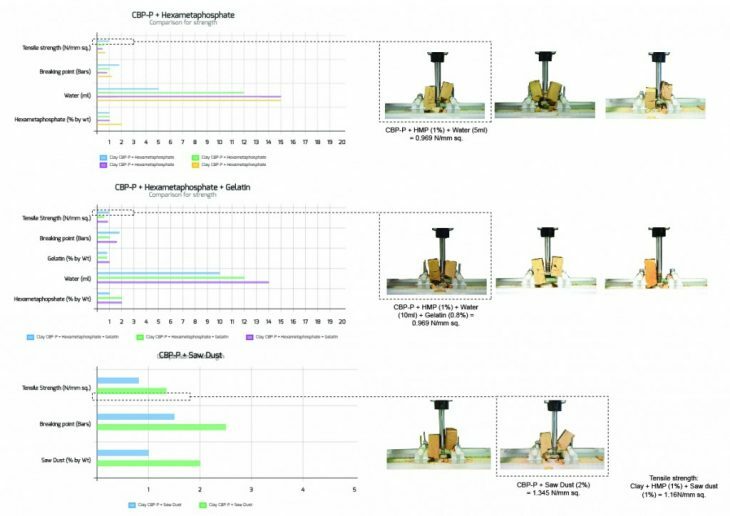 Understanding and Developing material properties for Printability by mechanical tests and material experiments. When material properties are discussed in the process of Additive manufacturing, the main element analysed is the properties embedded within one straight line extrusion. In this project, the thermal performance and structural properties of unbaked, locally sourced clay are being explored. With 3d printing, the possibilities of controlling material deposition reduces the volume of material consumed, as well as allowing us to manipulate thermal lag, structural cores and adaptive facade designs. Thus the need to achieve higher tensile strength in order to print at an architectural scale. In the contemporary construction industry, more specifically in the field of material science, all material testing machines able to determine the material properties are based on a standard compressed block. This testing technique works well in form-making, casting and pouring materials, but not in 3d printing based construction. When a clay block is casted, it showcases the performance of a standard brick with variations in strength and passive performance due to the material’s inherent properties. Whereas in 3d printing, the parameters are focused on each layer that is printed. The issue of attaining higher strength in printing, while tackling the limitations of the material and technology needs to be addressed through achieving a middle ground. Hence, the strength of the material is based on a feedback loop between the material properties, printing parameters and the structurally analysed design of the toolpath. In this scenario, each layer of print needs to be treated as a micro block, which when layered over each other, can give the overall geometry a higher strength. Hence understanding the proportion of possible additives, proteins and fibres in relation to the material viscosity, density and print-ability is a key factor to printing both efficiently and bigger. Today’s 3D printing technology is evolving to also incorporate the use of various materials such as concrete, ceramic and clay. In 3d printing with unfired clay, the material viscosity, material additives and strength to be set to differ from that of a conventional brick construction using the same materials. The use of uncooked clay allows to minimise energy consumption, during the clay firing and also facilitates the potentials of on-site construction using local materials. This change, using uncooked clay, challenges the material properties, to be optimised in order to perform and satisfy the functionalities that would be obtained if using cooked clay. One of the main reasons for firing clay bricks is to dissipate humidity from within the brick entirely. If the moisture content is not completely drawn out, the strength, life-time and the general performance of the brick is compromised. While water being the key element in the material mix, it also has a two-way role in making the mix better but also potentially making the final block weaker. In order to overcome the issue of drying without firing the material, the first step is to determine the minimum moisture content required in the mix to be able to mould a piece by hand. Once the minimum values for the above mentioned observations were extrapolated, the next set of experiments dealt with optimising these parameters, by adding additives with specific properties that enhance the performance of the material. Dispersant – It is a deflocculant, which allows the dense clay, along with any other dry additive, to disperse evenly and allow the material to uniformly mix. Inert matter – Any naturally available inert matter, which increases the granularity and hence maintains a balance with the amount of water to be added. It technically does not mix or dissolve but performs as a balancing agent by replacing the voids within the clay and water molecules. Fibers – Fibers based on their sizes can be categorized for either brick casting or for extrusion. In this case we required smaller fibers that act as reinforcements to provide a tensile property to the material mix. 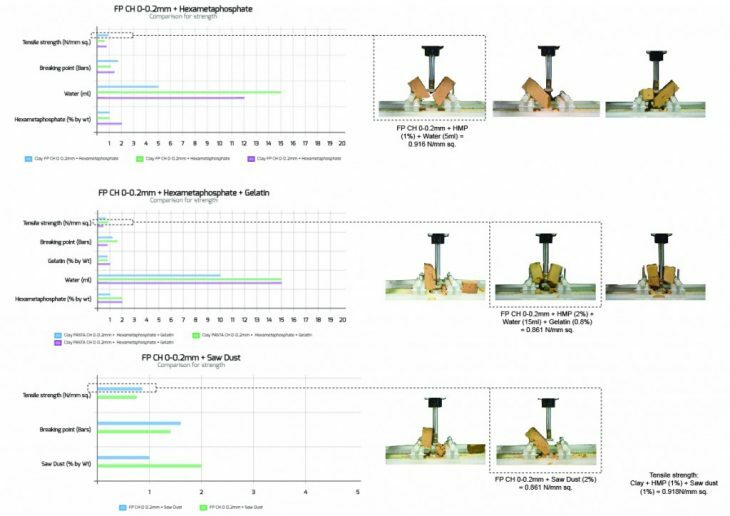 This will helps to conclude that how well the material can be calibrated to give it similar or better properties than cast molded clay bricks. In general, though the material mix and additives may be different, the goal is to achieve similar material properties between the traditional technique used and 3d printed material. Exclusively in the case of 3d printing and its requirements, the material needs to be reworked to satisfy the printability issues. Since the extrusion is provided by a highly pressurised pneumatic piston, there is a very organised rearrangement of matter within the extruders tank. Hence ensuring while the line is printed, there is no air gap or bubbles stored within the line. This allows an even deposition of material throughout which the strength is enhanced and the possibilities of cracking during curing are reduced. This when compared to a brick, not only consumes much less volume of material, but also has more surfaces exposed to the environment which helps in uniform dissipation of moisture from the block. 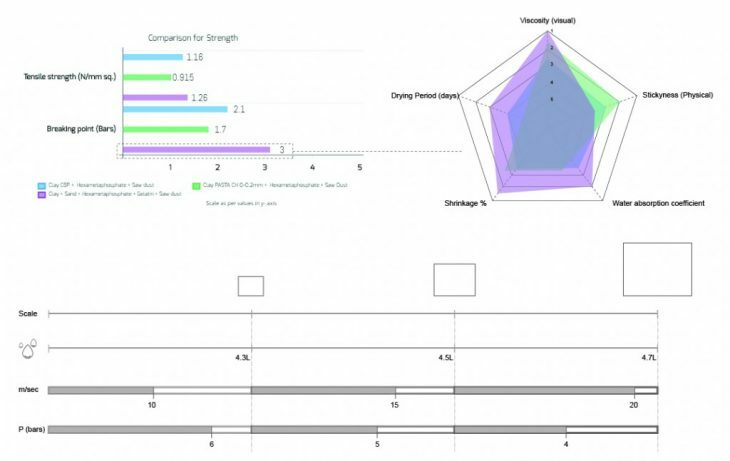 In the process of understanding the material properties and optimizing its performance, a key list of parameters were analysed. The strength of the printed geometry is a combination of not just stronger material mix, but also structurally informed design technique. The Material mix and the property of each additive influences the final result in many ways, thus giving a variety of options for application. From The ratio of the printing scale to the printing speed and pneumatic pressure defined the input parameters of the material mix. With change in either viscosity or density of the extrusion material, the strength, shrinkage and performance of the extruded material can be controlled based on the requirements. Though with the major issues of shrinkage and strength, the material can be optimized to either less than 1% shrinkage or no shrinkage at all. But all of this needs to be done keeping in mind the viscosity and strength that can be achieved via 3D printing. 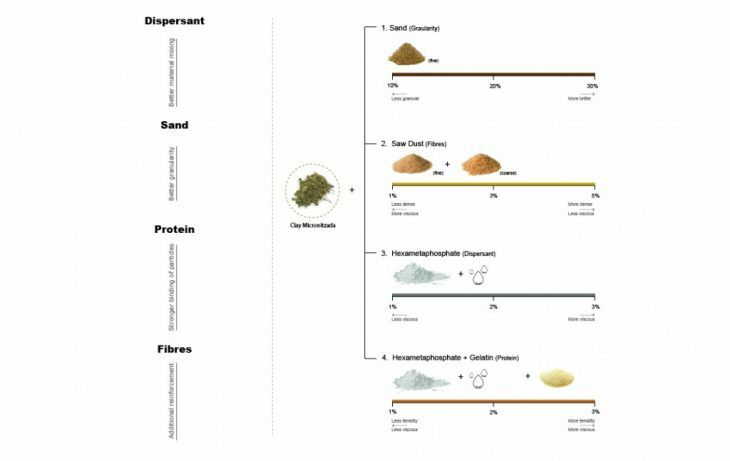 The solution is multiple explorations of various other additives such as other deflocculants or varied sizes of sand from different origins to see what are the possibilities by increasing the material mix inputs. And with time much more can be achieved in terms of an optimized mix applicable for specific purpose such as, structural core, faster printing, thermal mass or just an external aesthetic layer. 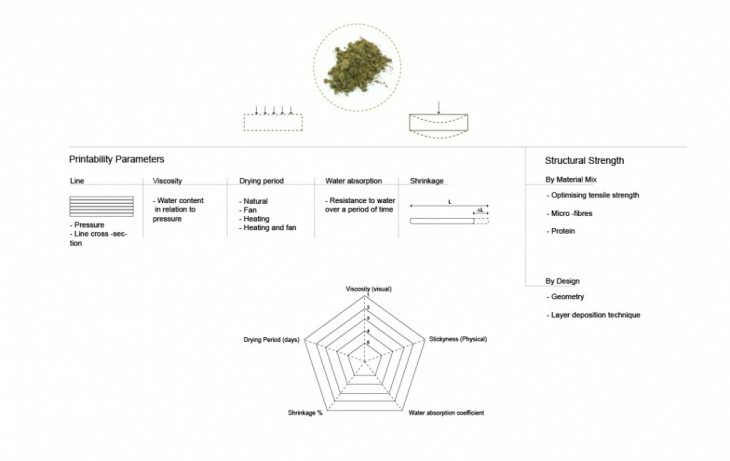 The approach of analysing and comparing as building blocks gives a better clarification with specific rules that can be easily compared by performance in terms of either design or strength. Along with these parameters comes with advantage of optimised material deposition which is an efficient use in quantity to thus increase the quality.